Though I stayed in Breckenridge, I drove over the pass for a hike in Vail. Most of the hikes in Vail are rated as hard as they tend to be long with significant elevation gain. I didn’t have all day, as I was meeting some friends in Vail for dinner, so I picked one of the easiest trails I could find. Bighorn Creek Trail is 6.9 miles and rated as moderate. The parking, with only about six spots at the trailhead and six spots down the road, was extremely limited especially given no parking is allowed on the road and the trailhead parking is limited three hours. In addition, I don’t think the regular hiker can finish this trail to the cabin in three hours except perhaps a trail runner. The moderate rating was a bit of a misnomer though comparative to other hikes in the area, maybe it is correctly ranked. The dry dirt trail begins with a steep climb and then levels off through a grove of aspen. A small boulder field and a mountainside of dormant fireweed intermingle with more aspen before the trail begins to climb. The next climb, at a 34% grade is very steep to another large boulder field. 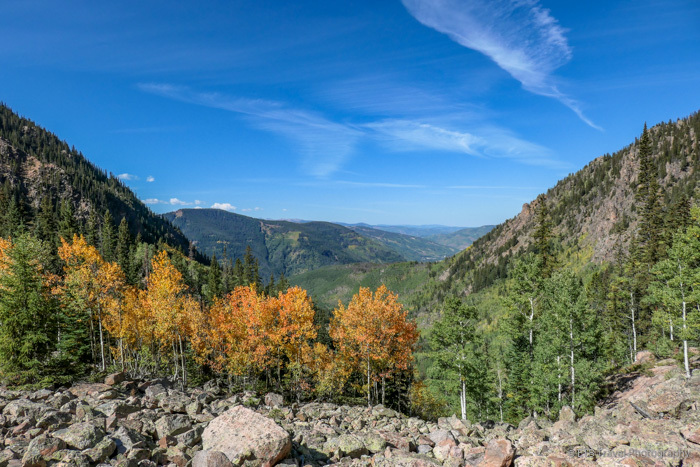 The view of the valley peppered in golden aspen was lovely. The trails continues back through the forest and eventually reaches a cabin that I found to be anti-climatic. The trail does continue further, but this hike listed on All Trails ends at the cabin.